View Richard Nixon and over 3,000,000 other topics on Qwiki. 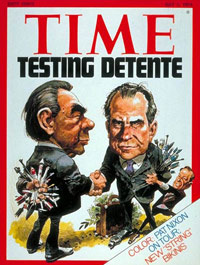 Richard Nixon, the 37th American President, began Vietnamization and the policy of detente (strategy to lessen Cold War tensions). The Watergate Scandal caused him to resign, but detente continued. Examples of it was the Nuclear Strategic Parity, the Nuclear Non-Proliferation Treaty, and Ostpolitik.